Situated in Minneapolis, this vacation home is 0.2 mi (0.4 km) from Chain of Lakes and within 3 mi (5 km) of Minneapolis Convention Center and Walker Art Center. Minneapolis Institute of Arts and Nicollet Mall are also within 3 mi (5 km). Situated in Minneapolis, this romantic vacation home is 0.1 mi (0.1 km) from Chain of Lakes and within 3 mi (5 km) of Walker Art Center and Minneapolis Institute of Arts. Nicollet Mall is 2.9 mi (4.6 km) away. Situated in Minneapolis, this property is 0.3 mi (0.5 km) from Chain of Lakes and within 3 mi (5 km) of Minneapolis Convention Center and Walker Art Center. Minneapolis Institute of Arts and Nicollet Mall are also within 3 mi (5 km). 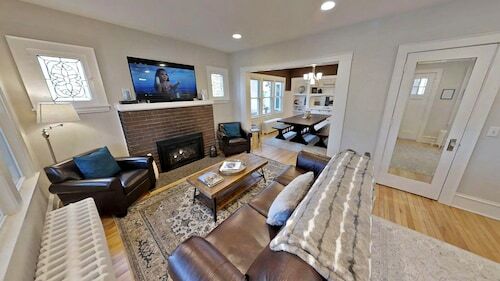 Situated in Minneapolis, this vacation home is 0.5 mi (0.8 km) from Chain of Lakes and within 3 mi (5 km) of Minneapolis Convention Center and Target Center. Walker Art Center and Minneapolis Institute of Arts are also within 3 mi (5 km). Situated in Minneapolis, this historic property is 0.1 mi (0.1 km) from Chain of Lakes and within 3 mi (5 km) of Minneapolis Convention Center and Walker Art Center. Minneapolis Institute of Arts and Nicollet Mall are also within 3 mi (5 km). Uptown 4BR Steps to Lake Calhoun, Near Downtown&mall of America, Garden Patio!! 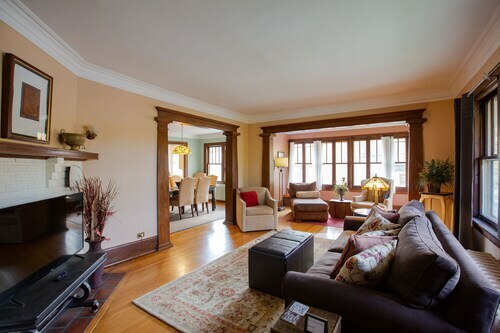 Situated in Minneapolis, this historic property is 0.3 mi (0.4 km) from Chain of Lakes and within 3 mi (5 km) of Minneapolis Convention Center and Target Center. Walker Art Center and Minneapolis Institute of Arts are also within 3 mi (5 km). Situated in Minneapolis, this vacation home is 0.4 mi (0.7 km) from Chain of Lakes and within 3 mi (5 km) of Minneapolis Convention Center and Target Center. Walker Art Center and Minneapolis Institute of Arts are also within 3 mi (5 km). Situated in Minneapolis, this property is 0.9 mi (1.4 km) from Chain of Lakes and within 3 mi (5 km) of Minneapolis Convention Center and Walker Art Center. Minneapolis Institute of Arts and Nicollet Mall are also within 3 mi (5 km). Lakewood Cemetery is certainly a place worth making the time for. Minneapolis - St. Paul, the city where it is located, is an alluring place to visit at any time of the year. You don't have to venture far to find a hotel. There are 86 possibilities within 6 miles (10 kilometers) of Lakewood Cemetery. See which one catches your eye out of the Hotel Ivy, a Luxury Collection Hotel, Minneapolis and Residence Inn By Marriott Minneapolis Downtown. If you are fine without fancy furnishings, you may book a room at one of the low-cost solutions just a short drive away. A couple of your choices include the Days Inn Hotel on University and the University Inn. After a never-ending day, rest your worn-out legs at a premier establishment that's not too far away. The Loews Minneapolis Hotel and The Westin Edina Galleria are perfect choices that are worth considering. A big day of sightseeing can truly stimulate the appetite. When hunger strikes and you need to have a bite, visit Dunn Brothers Coffee (3348 Hennepin Avenue South, Minneapolis), 0.3 miles (0.5 kilometers) away. Take a trip through the informative exhibits and displays at Minnesota Streetcar Museum, a fun excursion for the whole family. Are you looking for a green space where you can enjoy a relaxing stroll or just bask in the sun? Head over to Lyndale Park. Relax and enjoy the beauty of nature on the shores of Lake Calhoun. Make a night of it, and go out for dinner after attending a concert at Lake Harriet Band Shell, a dedicated local venue. Prepare for a night full of talent when you visit Bryant-Lake Bowl. How Much is a Hotel Room in Lakewood Cemetery? Hotels in Lakewood Cemetery start at $101 per night. Prices and availability subject to change. Additional terms may apply. 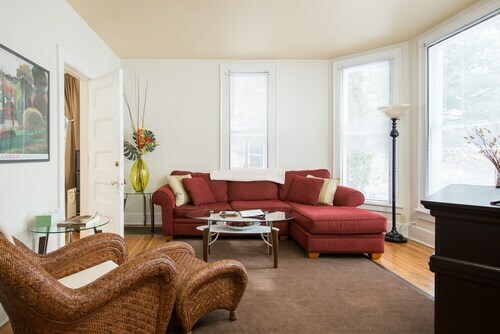 Designer Built and Hosted 1br1ba Apartment in Uptown! Garage bay Included!